Acer Iconia Tab A100: 7-inch Honeycomb tablet for £300? If there's one major criticism being levelled at Android Honeycomb tablets, it's that they're not being priced reasonably enough to lure people away from the iPad. Acer's obviously taken note of this, as its upcoming 7-inch Iconia Tab A100 will weigh in at an iPad-undercutting £300. Obviously, at only 7-inches you'd expect a lower price point than the 10-inch posse, but the A100 doesn't scrimp on the specs. It boasts the same Tegra 2 dual-core processor as its Android brethren, 512Mb of RAM (not the 512kb Amazon has in the listing) and Android Honeycomb. Its miniscule 8GB hard drive seems to be the only down side here. 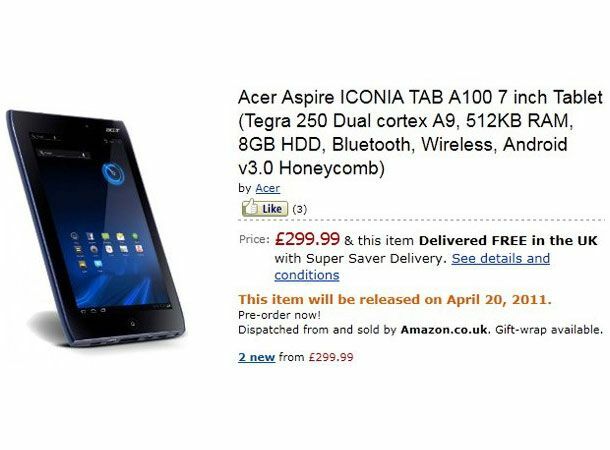 Amazon has the Iconia A100 priced at £300, with a UK release set for April 20th. Are you keen for some budget Honeycomb action? Let us know on the T3 Twitter feed.